I finally read a Cadfael mystery. 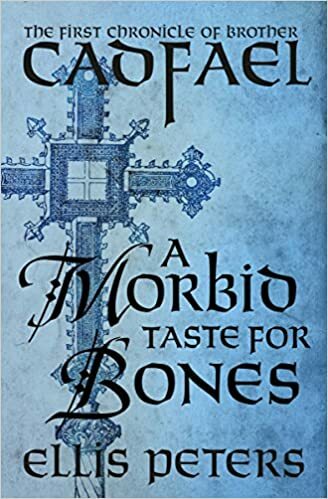 A Morbid Taste for Bones is the first book in Ellis Peters’ Chronicles of Brother Cadfael series. The eponymous Benedictine monk has had quite a life. Before entering the abbey of Saint Peter and Saint Paul in Shrewsbury, Cadfael was Godfrey de Bouillon’s companion during the First Crusade. At the start of the novel, Cadfael is working in the abbey garden alongside two other brothers: Brother Columbanus (a raging mystic) and Brother John (who is tempted by the pleasures of the outside world). But the peace of the monastery is suddenly broken when Prior Robert Pennant asks the brothers to find relics to bolster the abbey’s reputation. Each of the surrounding Benedictine monasteries house the relics of a miracle-working saint, but Saint Peter and Saint Paul has nothing to boast of. Ever ambitious, Prior Robert seeks far and wide for a saint to unearth and carry back to the English abbey. Finally, Brother Jerome receives visions confirming the intercession of a Saint Winifred. These alleged visions inspire the prior to lead a procession of monks to the saint’s burial site. Unfortunately, Brother Robert has underestimated the amount of effort it will take to convince the Welshmen of Gwytherin to relinquish the bones of their village saint to a group of English monks. Upon his arrival, Brother Cadfael runs into a young woman named Sioned. For a Welsh woman, she is surprisingly competent in English. Soon, Cadfael learns about her secret love for an English ex-outlaw and the advances of a suitor to whom she is indifferent. Sioned’s father Rhisiart respects and even houses the ex-outlaw Engelard, but he objects to Engelard’s interest in his daughter. Further, he opposes Prior Robert’s quest. Rhisiart may be the only obstacle between the Shrewsbury monks and the miracle-working saint on the one hand and Sioned and Engelard on the other, but who would want him dead? While A Morbid Taste for Bones is a murder mystery, it is also written as a work of historical fiction. Ellis Peters describes the Welsh village of Gwytherin with an eye to historical accuracy. The mystery is only one plot line in the novel. We are also introduced to English monasticism and the English-Welsh conflict. In many mysteries, the setting and characters are secondary to the intrigue. But not in A Morbid Taste for Bones. The mystery element seems almost accidental to Prior Robert’s quest. Benedictine abbeys in the 11th century were concerned about their reputations; holy relics helped them compete with surrounding monasteries. Brother Cadfael may be religious but he is also practical. He draws from a lifetime’s worth of experiences to fulfill his monastic and social duties. He knows how to play the game. I look forward to learning more about Brother Cadfael and his fellow monks in the rest of the series. Peters has managed to write a book that appeals to mystery buffs and medievalists alike.